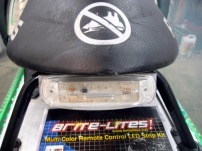 Brite Lites has developed a larger strip light with 12 Super Bright LEDs to make it a compact light unit with 2 rows of 6 LEDs to make a great stand alone taillight and brake light. The brightest LED taillight we have ever built. -Light is 6 3/8" long, 1 7/8" tall, and 15/16" deep, with the 3 wires exiting in center back of unit. 3M foam adhesive tape on back for self stick or dual screw mounting holes. Chrome bezel is removable if not desired. -Standard 3 wire connections for all typical DC 12v positive polarity electrical systems. 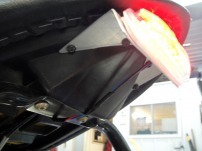 (note: Polaris CFI sleds are negative polarity and require the use of our CFI adaptor to function brake light) -Available in clear lens with red 2 function LEDs Run & Brake -MSRP is $29.99 each light and are currently available for shipment!